For a fishing adventure that’s right in town but feels like you’re miles away, try the Paul Stock Aquatic Area. The Paul Stock Aquatic Area is a gem of a spot, located within the city limits. This section of the Shoshone River is accessed via two city parks. You’re just a mile from downtown, but this area can have an isolated feel to it especially early in the morning. Although the trails leading to the water can be hot in mid-day, along the bank you’ll have some shade and the cooling waters of the river itself to make for a very enjoyable time. Ease of access is what makes this fishing spot fabulous. There are trails which take you a mile upstream and about equal distance downstream, with access to the river the entire distance. Upstream you’ll get rimrocked by the cliffs below the Buffalo Bill Center of the West. This section of river actually has two entrance points. The first is the Paul Stock Trail off of Riverview Drive and the second is the trailhead at the end of 12th Street at Shoshone Riverways Park. The river near the Paul Stock Trail seems slightly less busy. Dog walkers frequent these paths, as well as fishermen with a lone horse rider periodically trotting by. There’s less car traffic to hear and no development across the river, which combine to make this spot feel quite out of the way. The Shoshone Riverways Trail starts just under the substantial Belfry Bridge so there’s a lot more road noise. Downstream you might hear heavy equipment operating on either side of the river, but generally once you’re past the bridge it quiets down. This path is also popular with dog walkers, runners and cyclists and is a favored launch for guided fishing trips. If you only have a short amount of time to wet a line, this is the perfect place to do it. You’ll definitely be spending more time casting than driving. You’ll get views of the Shoshone Canyon and Rattlesnake Mountain as well as the picturesque river itself. The banks are vegetated with willow, grasses and occasional cottonwoods but not so heavy as to be unfishable. If you didn’t bring waders or a float tube, bank fishing can be superb on this section of the river. 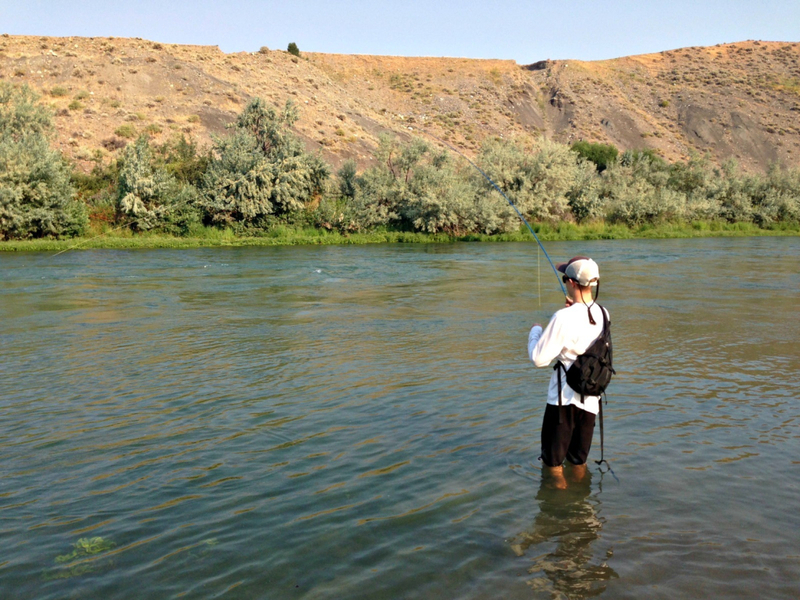 The Shoshone through Cody is a tailwater fishery thanks to the Buffalo Bill dam upstream. 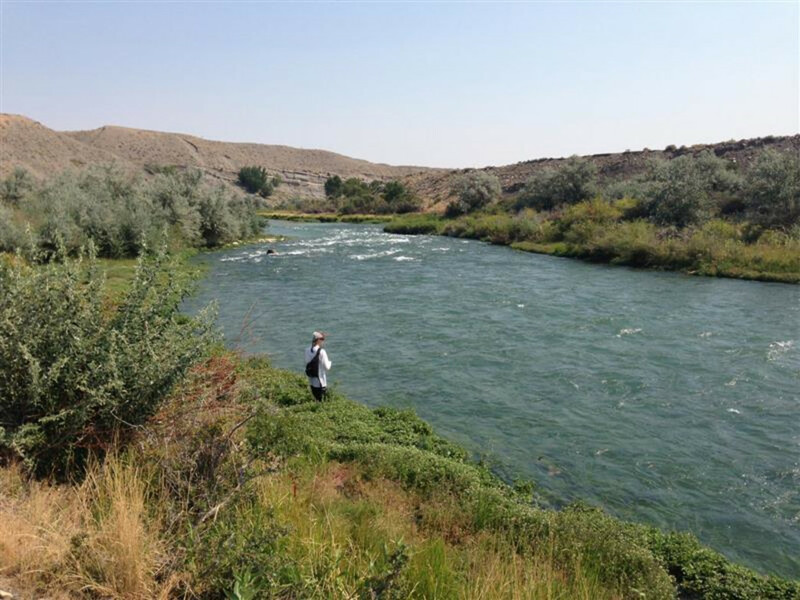 You’ll find rainbow trout, brown trout and Snake River cutthroat hiding out in the riffles and pools. Fishing is best here mid-October through mid-April when the flows are down. During the rest of the year you’ll need to float this section. Fishing in summer can be fine as well, but increased irrigation needs means higher water and more difficulty casting from the bank. The river is a wildlife corridor and adventurers out early in the morning might see mule deer, white-tail deer, fox and even the occasional black bear and mountain lion. Rattlesnakes are a distinct possibility as well. From downtown Cody take Sheridan Avenue to 12th Street. Turn north and continue about a mile to the intersection of Riverview Drive and 12th Streets. Turn left onto Riverview Drive to access the Paul Stock Trail about ¼ mile to the west. The parking area will be on the right, past the last house on the right. To access the Shoshone Riverways Park go straight through the 4-way stop and down the hill to the river. Both trailheads have ample parking. The Shoshone Riverways park also has a vault toilet, picnic tables and changing room. Water is not available at either site. There are no fees and leashed pets are welcome.